Landscape: Semi-arid and very hilly. Lots of white, sandy beaches. Visited: With the Angelos from Feb 28 to March 3, 2002. 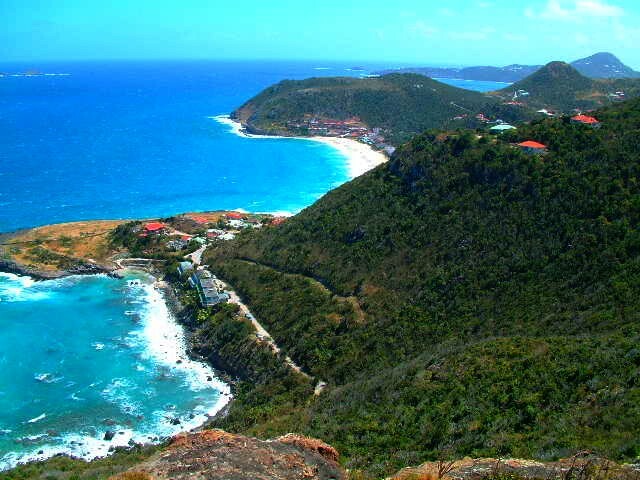 History: The French attempted to colonize St. Barths (pronounced St. Barts) from Kitts in 1648. Caribs raided in 1656, and massacred all the colonists, so it lay abandoned for many years, because the Caribs couldn’t live there permanently because of the lack of reliable fresh water. In 1673, Huguenots from Normandy and Brittany established the first permanent settlement. Because of the arid conditions, prosperity didn’t come from crops and plantations, or even fishing, but from French buccaneers who used St. Barths as a base for raids on Spanish galleons. Because there was no need for African slaves on a non-plantation based island, the population stayed predominantly European. In 1784, King Louis XVI passed on the island to King Gustaf III of Sweden. The Swedes renamed the island’s port to Gustavia, built a town hall, and fortified the island. 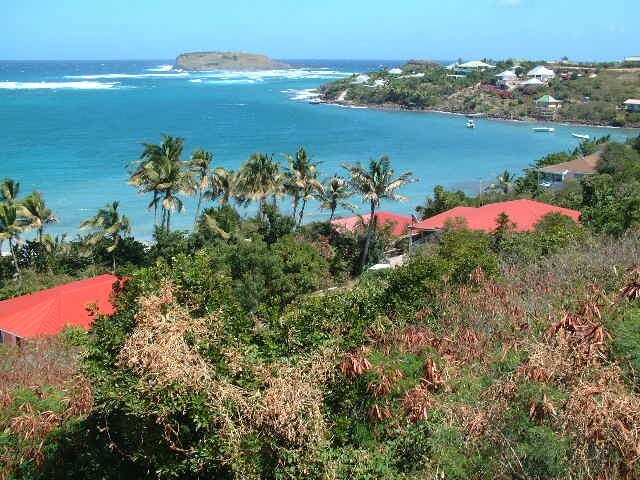 Hoping to gain money on their newly acquired outpost, they turned St. Barths into a duty-free port, and by 1800 the population had grown to 6,000. In 1852, a fire swept across Gustavia, destroying the town. By that time, changes in trade routes had led to a decline in trade and population, and most of the city was not rebuilt. In 1871, the Swedes, wanting to undo their losses on Barths, sold the island back to France, and it has stayed that way since. (Amanda, 12) With Laurie, Jerry, and Claire Angelo on board, we made our first crossing to St. Barths. The island got the nickname of 'St. Barfs' because it is usually an unpleasant sail to get there, but we had a magnificent sail, with the wind coming out of the northeast instead of straight in front of us. From the boat, it looked like a completely vertical, up-and-down island. When we got ashore, our observation became true. Barths is widespread over about 1,000 ft (300m). While that's not actually very high, there are lots of hills that are so close together that you can't drive between them. That first day, we walked around a bit, and from sea level, pretty much everything was up. Up, up, and even more up. We did, however, find a nice beach around the corner from Gustavia, called Shell Beach for all the small shells tossed up on it, that had another Kronos anchored in it! It looked different than all the Kronos catamarans, as it was painted completely silver, with Chinese or Japanese or something symbols on it. We decided that it looked like a quite nice anchorage, and when we got back to the boat, currently anchored off Gustavia, we upped anchor, and motored around the corner. (Jon) In St. Barths we found Robin Sheppard, an old friend who's been building houses for the rich and famous on St. Barths for years. Robin loaned us a vehicle for the day so we got to tour the island in fine style, with the kids in the back of the pickup. The roads on St. Barths are quite ridiculous, often going to only one lane, and often requiring second (if not first) gear. 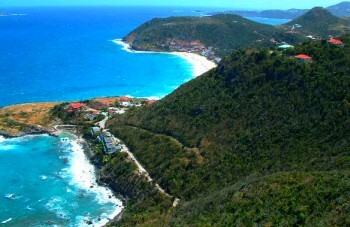 There are lovely view points overlooking the ocean, and delightful restaurants sprinkled all over the island. If you're planning to fly into St. Barths, be prepared for a really hairy landing. There's not a lot of flat land. The plane first has to come over a hill that has a 3-way stop sign on top. Then it has to dive down to the runway below. Once it touches down, it has to stop in a real hurry, or else it ends up in the ocean which is just at the end of the runway. They usually use Canadian Twin Otter STOL (Short Take Off and Landing) planes. (Sue) I think I enjoyed this visit to St. Barths more than others, partly because we took the time to explore other anchorages, and to snorkel off the many rocky islands that guard the entrance to the Gustavia harbor. The highlight, of course was chancing to anchor right next to our friend Robin whom we hadn't seen for 11 years (and the last time was in Oregon...). 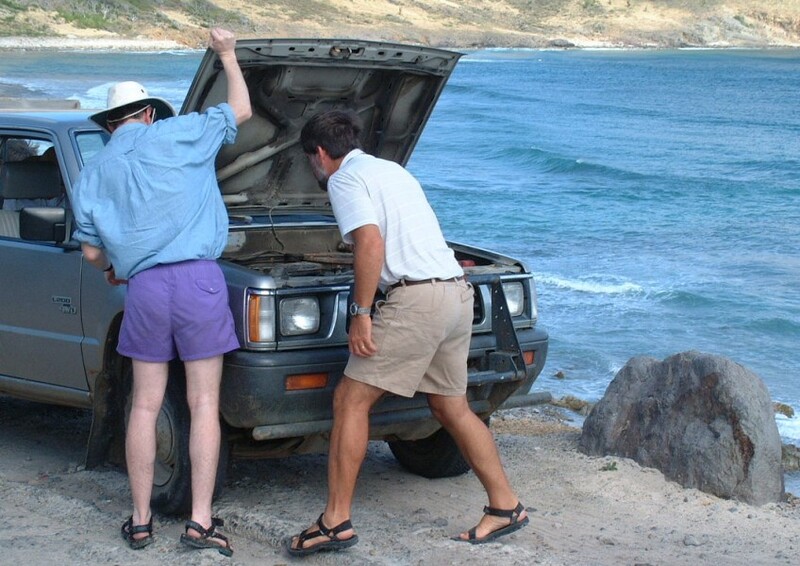 Of course, I can't resist commenting that the drive in Robin's wonderful truck was punctuated by a brief stop on the side of the road to check the horrific engine noises (turned out to be muffler). But what would a Hacking car adventure be without at least one emergency stop?? 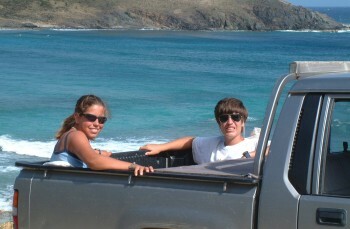 (Chris, age 15) St. Barths was nice, in a dry sort of way. I didn't see much fresh water, although it seemed more lush than St. Martin or Anguilla. We did have an interesting time there, and a very good lunch at a nice-sized island restaurant. It is not a large island, but was nicer looking (to my eye) than either of the two other main islands (St. Martin and Anguilla) we had been to so far. We were able to explore it to my satisfaction in the time we were there.